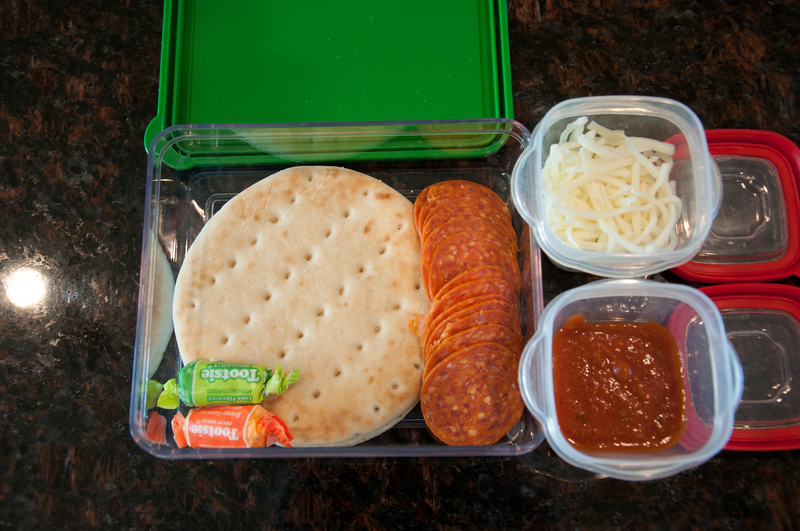 homemade lunchables – Snap. Eat. Run. “Back to school, back to school, to prove to Dad that I’m not a fool…” Name that movie. 🙂 That song pops into my head every August when school starts and again in January when Christmas break is over. And Christmas break is, once again, over. Today was my boy’s last day of mind-numbing video game playing before heading back to kindergarten. For me, back to school means rolling kids out of bed early, making sure the uniforms are clean, and packing lunch after lunch after lunch. I’ve got a picky eater, folks. Cafeteria lunch just won’t do for this one. We go through a lot of peanut butter crackers and Lunchables around here. Over the break, I was shopping in a Pottery Barn/Pottery Barn Kids/West Elm/Williams-Sonoma Outlet (also known as a little slice of heaven on earth), and I stumbled upon these clear plastic storage boxes. At $0.97, I had to have them! I would also like to know who in their right mind would have paid $7.50 for it?! I thought they’d be the perfect size to pack my own Lunchables, because depending on the week, those babies can be expensive! I spent maybe 20 minutes this morning assembling them, and I’ve got four ready for the two days of school/preschool we have this week. I could have cranked out more if only I’d had more boxes! The pizza Lunchable. Unfortunately, my two mini containers don’t fit inside the box. That’s only a minor bummer. I used Whitewheat bread rounds for the crust and added in the pepperoni, mozzarella, and marinara sauce. I even threw in a couple small pieces of candy, since half the fun of the Lunchable is the treat. This is my take on one of those fancy, grown-up Lunchables you can buy now. My daughter loves them. 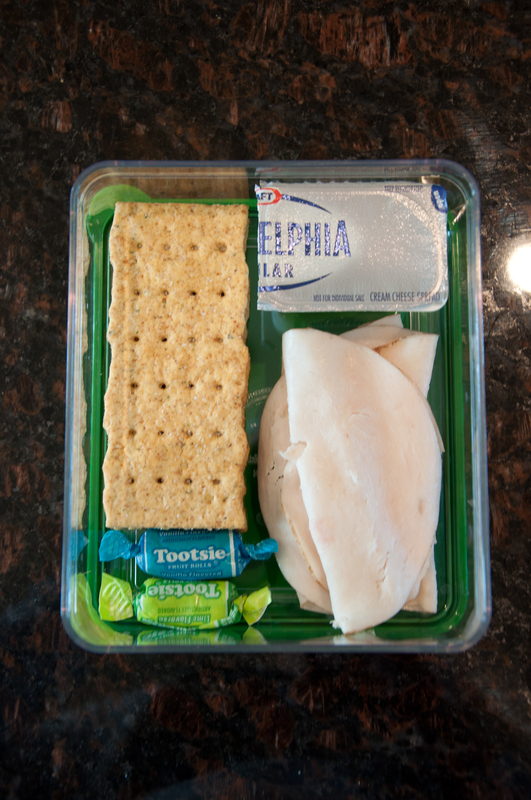 I use Wheat Thins flatbread crackers, deli meat, and a miniature container of Philadelphia cream cheese. The only thing missing is the adorable little spreader. I’ve ordered some wooden demi-spoons from Garnish to serve that purpose. 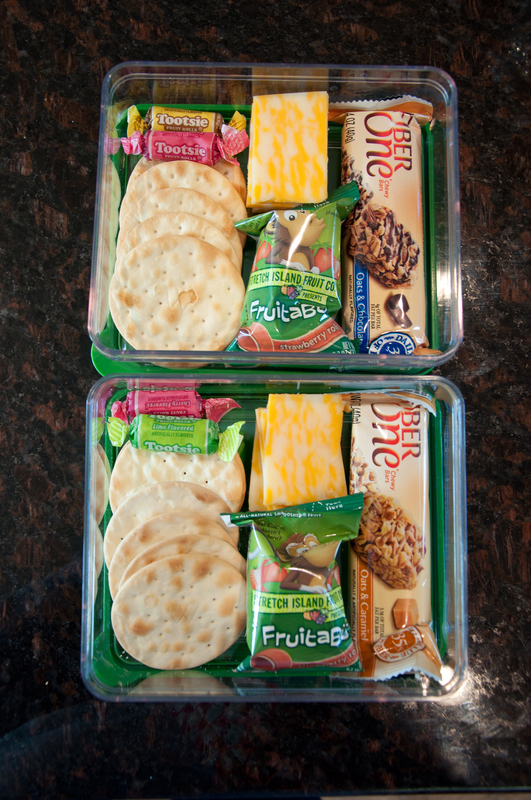 Last, but certainly not least, the traditional crackers and cheese Lunchable. I left out the meat in this one, because my children never eat it. I instead added a granola bar, fruit roll, and of course, the candy. Add a juice box, and I’m done!